The Gloomy Moon Singers were the house band at Berlin`s Riverboat Club. In 1964 they came in second in a battle of the bands at the Star Club, losing the first prize to the more stylish Lords. They recorded one more 45 for the Telefunken label before changing to simply The Gloomys, and more of a pop direction. 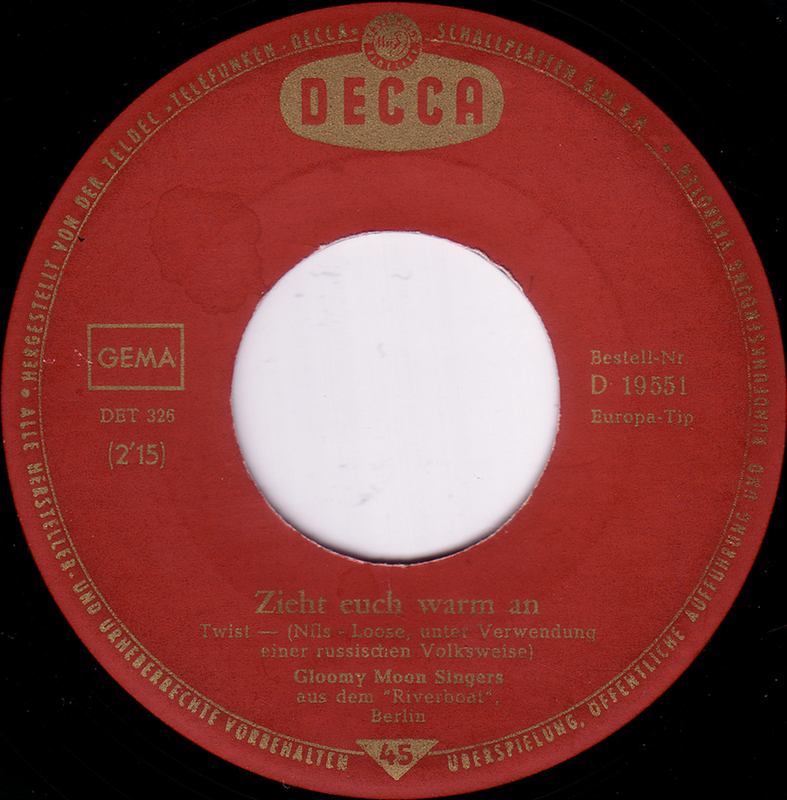 The most famous band member of The Gloomy Moon Singers was Frank Zander, a German Pop singer who had many hits, singing novelty songs in his gruff trade-mark voice. I have not been able to find any photos or information about the Riverboat. My daughter has recorded that song and we plan to do a video so it would be great to get some neat photos to use in the video. I was there in July of 1967 and all I remember is that it was on top of a building very close to the Wall so that all the folks in the East could see what a great time you can have in a free country. Thanks a lot for sharing your memories. I was born in 1966 so it´s always a pleasure to see that those old records that I spend my time with, make the past come to life. I´m not in Berlin at the moment but I´ll search for some images of the Riverboat when I get back later this week and will send them to you. I was studying in Berlin in the summer of 1969 and met my future husband there – we spent an amazing evening at the Riverboat Club. I’ll be back in Berlin next spring and want to find this place -if it’s still there, will send pics. For a jubilee album of a friend becoming 50, the names of a historic photography regarding THE GLOOMYS do miss. Please be so kind to click here: http://www.gloomys.de/html/bilder_1.html – Is there anybody who could announce them from the left to the right or “at least” to drop a source where investigations might continue? Please send us an e-mail. Thanks so much!